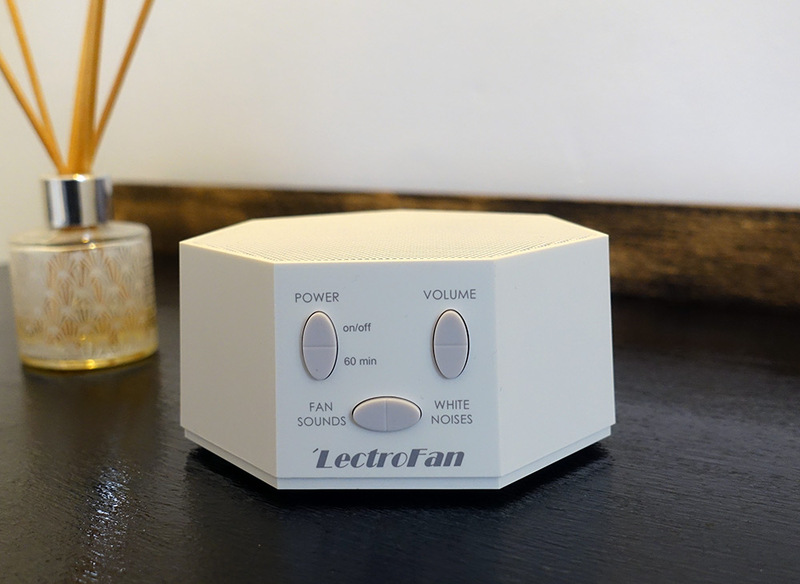 The LectroFan is a compact white noise machine which will fit neatly on a nightstand or office desk. It’s an excellent device if you’re looking specifically for white noise and fan sounds to help mask noise which is disturbing you, such as traffic or music from next door. In my video below, you can listen to the 10 white noise and 10 fan sounds it offers. Following that, there’s my full written review. How well does it mask external noise? The point of white noise is to both reduce how much environmental noise you hear, and to replace sudden noise changes with a constant noise instead. 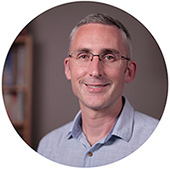 So before looking at the technical specifications, let’s address the most important question – does the LectoFan actually help block out noise? I’ve used the LectroFan both at night in the bedroom and during the day on my desk for several years. I’ve used it for that long simply because it does its job very well, with dynamically produced white noise that doesn’t loop, click or restart. I like that it has an upward facing speaker which fill the room with sound. And it gives you very precise volume control so you can find the lowest possible volume that still works. And if you do need more volume, it has the loudest maximum of any device I’ve tested – up to 20 dB louder than other machines, according to the manufacturer. Overall, I was impressed by just how much noise was hidden behind the LectroFan’s constant sound. It’s to be expected that some very loud noise will still be picked up by your ears. But even in those cases, it made the noise much less jarring. And that makes it less likely you’ll be disturbed while sleeping. If the snoring is coming from another bedroom, I’ve found the LectroFan is able to significantly reduce or mask it completely. But if you’re sleeping right next to a snorer, a white noise machine is never going to cut it out completely – unless you sleep with it right next to your head in bed – not an option I recommend! It might help a little, and only if your partner doesn’t mind having it on. But really, you’d be better off with a device that has a headphone jack. This is a feature that the classic LectroFan lacks, and that they’ve addressed with the new LectroFan Evo. There are a total of 10 white noise variations, and 10 fan sounds. There are more of the deeper sounding pink and brown noise choices than white noise. For many people, these types are easier on the ear. In some descriptions, the manufacturer now gives each of these a different color, such as chestnut, cinnamon, and tan. But really, the main point is that some just sound much deeper than others! Of all these sounds, I personally find 12 of them pleasant to listen to at low to medium volumes. There are another 8 I wouldn’t choose – but that might be totally different for you. At loud volumes, I definitely prefer the pink and brown noises. And I prefer the less industrial fan sounds, as I find them more calming to listen to. Again though, some people will like those heavier industrial fan sounds. It has a USB cable and comes with adaptor plugs for the US, UK and EU. So you can plug it into a standard wall socket, any other USB plug you have, or run it from a computer. There’s no battery option though, and no internal battery that can be charged for wireless play. So you do need to keep it plugged in. The power cable is around a meter and a half long, which is enough to reach a bedside table. The LectroFan is surprisingly small – considerably smaller than some competitors like the Marpac Dohm and Sound+Sleep machines. It does have a little weight to it compared to some of the very smallest devices. So although size isn’t an issue if you’re thinking of packing it in a suitcase, I’d probably choose the LectroFan Micro over this one if you’re a regular traveler and portability is a make or break point for you. There’s just one auto-off timer option of 60 minutes. This is somewhat lacking compared to devices like the Avantek or Sound+Sleep, but it’s still good to have at least one timer. The Lectrofan looks neat with its hexagonal design and choice of white or black finish. It also feels solid, which is a nice change from some of the cheaply made plastic sound machines out there. Being small, it occupies little real estate on a nightstand or desk, which is always a bonus. 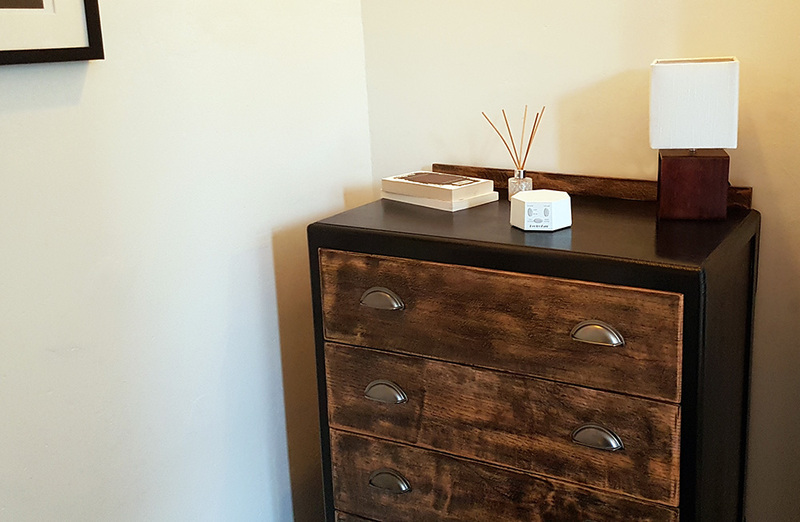 The lack of a display, lights or buttons will appeal if you lean towards minimalist design. But if you like your gadgets to have lots of buttons, blinking lights and a visual display, you might be underwhelmed by this one. The LectroFan might not be the flashiest gadget in the world and has an obvious lack of enticing features, but it does its job very well. There’s no other device which has such a wide variety of white noise and fan sounds. Compared to many sound machines that offer one or two white noise options at best, with more of a focus on nature sounds, there’s a better chance you’ll find a white noise variation you actually like. And at the end of the day, if you’re trying to replace an annoying sound with another, constant sound then it needs to be a good one. With the excellent speaker quality and dynamically generated sounds, the white noise it produces is authentic and relaxing to listen to (mostly!). Combine that with the excellent volume control, and there’s every chance the LectroFan will help prevent your study or sleep being disturbed by the uncontrollable world around you. In your review you state that the Lectrofan Classic on high is “up to 20 dB louder than other machines”. What is the actual dB level on high? I believe it is approx. 80dB on the loudest setting.